Looking back and forward...a little bit of this and that as the clock ticks down. I can't believe how prejudiced I had always been towards certain camera brands and how this year really opened my mind. Take Canon for example. Pooey! 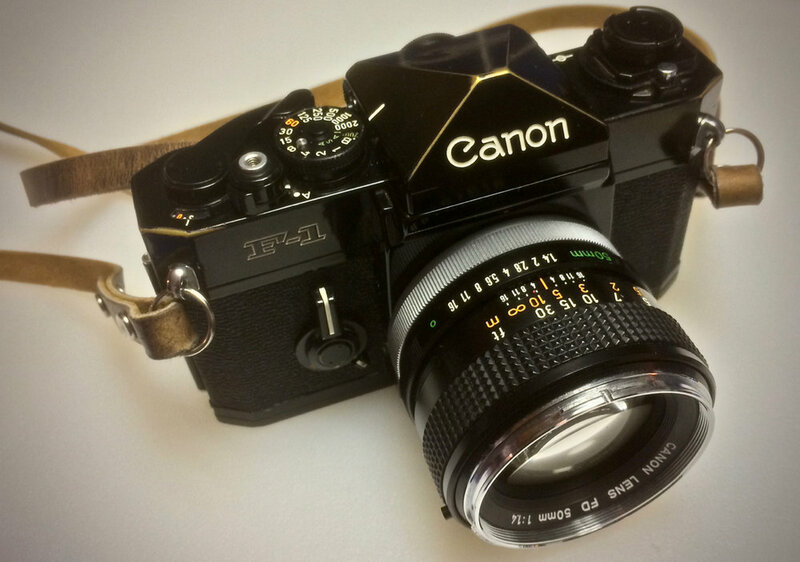 Until, on a lark, I tried a Canon F-1n 35mm SLR. Made me a Canon fan! It's a great, truly great professional grade SLR! I love shooting it, the FD lenses are wonderful and I can't recommend it enough! I enjoyed the F-1n so much, I bought its predecessor, the original F-1. While this camera doesn't have all the bells and whistles of the later version, its minimalism is endearing. The more I use it, the more the body reveals a wonderful brass patina. One of the cheapest cameras I have ever bought delighted me to no end as I "point and shot" my way through a Sonoma County winery this summer. Point & Shoot & More! Set the A-1 in program mode and let the camera do all of the heavy lifting. Or, take it out of automatic and learn to drive a stick shift. 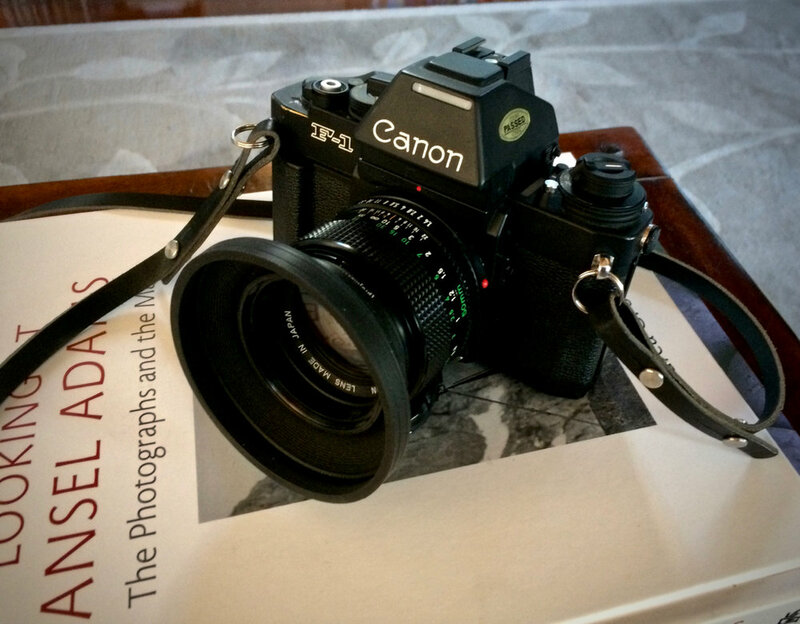 Hipsters are clamoring to buy AE-1s, making the better Canon A-1 a steal! If you see a nice A-1, buy it! Great camera! I would never try brussels sprouts because I had myself convinced I wouldn't like them. Then, I tried roasted brussels sprouts and guess what? Loved 'em! Somewhere on the internet, I read that Minolta cameras were plastic and cheap and prone to breaking, so I stayed away. Unexpectedly, a little XD fell into my hands this year. Small package. Lots of features! Although working fine, it had a smudge inside the viewfinder. After a quick trip up to Blue Moon Camera & Machine and a simple, affordable CLA, the Minolta XD quickly became one of my favorite shooters this year. This camera shoots in manual mode, shutter priority mode and aperture priority mode. It's small, light, made of metal and is the platform for a wide variety of stunning and affordable Minolta Rokkor lenses. I was wrong about Minolta. So much so that I went looking for a good example of a legendary camera; the XE-7. The XE-7 was released during a time when Minolta and Leica were joined at the hip. This camera has one of the nicest sounding shutters and smoothest film advance mechanisms of any classic SLR I have used. I love the fact that the XD and XE-7 can share the same lenses. Although my XE-7 is purring like a kitten, I like it so much that I am going to invest in a Mark Hama CLA in 2018. I stumbled across a professional photographer cleaning out his freezer. I bought some Plus-X from him (2012 expiration) and some Agfa APX (1998 expiration). I have no expectations of performance, but I've shot a roll of the Plus-X so far and it seems fine. As I have written before, about once a year, the Polaroid bug bites. Santa brought a pack of new color and a pack of black and white film for my SX-70, which spent the fall back in New York in Matt Widmann's shop. The camera got an extensive refurb. Like total rebuild! I got it back just before Christmas and shot a few test shots with the film pack Matt left for me in the camera. The guy is a genius and what fun to have an SX-70 that works like it is supposed to! There will be a series of posts next year documenting everything Matt did to my old Land Camera and some instant shots. 2017 has been the year of Pentax, another camera brand that I snubbed my nose at while shooting my Nikons and Leicas. I never would have tried my first Pentax camera, the ME Super, if it weren't for Jim Grey's Down The Road blog. I've had a lot of fun since discovering Pentax. Thanks Jim! To get better, to grow...you have to push yourself out of your comfort zone. I am far more comfortable with my camera on a deserted stretch of beach than I am poking it into the faces of strangers. That hasn't kept me from admiring the work of fine street photographers, past and present...and yearning to try it myself. I set a goal this year to read, study, learn and force myself to get out there and work at my own street photography. Two street workshops this year with my Leica M rangefinder and an "AH-HA" moment the last time out. I'll be posting more about that next year. I am grateful for the kind community of photographers, craftspeople and merchants I have gotten to know so well since re-entering film photography in earnest 8 years ago. The people shooting film and supporting film photographers right now are an amazing, giving group. Like my good friend Sover Wong in the UK who has carefully serviced all of my Nikon F2 cameras. Ken Hansen in New York who trusts me enough to send me a Leica before I have paid him for it. Eric Hendrickson who skillfully CLAs all of my classic Pentax bodies. Youxin Ye who returned youth to my Canon P rangefinder. The cool folks up at Blue Moon Camera & Machine who re-did my Minolta XD and Canon F-1. Bellamy Hunt, the Japan Camera Hunter, who is up to any camera or lens hunting challenge I've thrown at him. Matt Widmann at 2nd Shot SX70 Service who did an incredible job turning back the clock on my SX-70. The aforementioned Jim Grey, who got me on to Pentax cameras and offers frequent encouragement in the comments here. One of the first photo bloggers I discovered was Mike Connealy and I still look forward to his posts. Mike does amazing work with some very very old cameras. To the small group of regular readers of the Fogdog Blog...I so appreciate you and wish you the best of everything in the New Year.